The 2012 Olympic Games could overshoot its £9.3bn budget unless "rigorous action" is taken to curb costs, the Whitehall spending watchdog has warned. The National Audit Office said a doubling in estimated security costs meant there was a "real risk" more taxpayer funding would be needed. On Monday the government said an extra £271m was needed for security guards. Shadow Olympics Minister Tessa Jowell said despite it being a risky project she believes it will come in on budget. Ministers insist more than £500m remains in unallocated funds for dealing with any further contingencies. 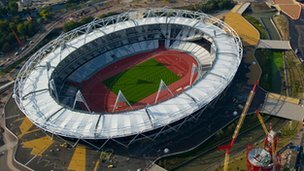 The National Audit Office (NAO) said the Olympic Delivery Authority (ODA) remained on course to complete its work on the Olympic Park on time and on budget. However, on current projections, the spending watchdog said almost all the £9.3bn public sector funding package was likely to be required, with little margin for any further unforeseen costs emerging in the final eight months. Sports minister Hugh Robertson said he had faith the financial targets would be met. "Clearly any big infrastructure project is always going to be quite finely balanced but, as at today, we will be 95% complete in terms of build by Christmas and we still have half a billion pounds left in the contingency to cover all known risks. So I'm as confident as I can be as the minister that we're going to deliver on time and within budget." But the head of the NAO, Amyas Morse, said "not everything is rosy" and the government had little room left for manoeuvre. "The government is confident that there is money available to meet known risks but, in my view, the likelihood that the Games can still be funded within the existing £9.3bn public sector funding package is so finely balanced that there is a real risk more money will be needed," he said. Ms Jowell said: "It has always been a risky project: its scale, its complexity, and the fact that there is absolutely no leeway on the time by which everything has got to be complete, ready for next year in 234 days' time - and it will be. "Hugh Robertson has said that he is confident that this will come in within the £9.235bn allocated when I was secretary of state, from public funds, for the Olympics and I believe that is still the case," she added. At the time of the bid in 2005, the estimated total public cost of staging the Games was £2.4bn. This was increased to £9.325bn in 2007 and then cut slightly to £9.298bn by the new government in May 2010. The contingency fund stood at £2.75bn in 2007, but in May 2010 the ODA said this had fallen to £1.27bn and by February this year a NAO report revealed the fund was down to £974m. Now the NAO has said, after the government's own estimate of meeting "assessed risks" was taken into account, there is £36m left in contingency funding. The chairman of the Commons Public Accounts Committee, Margaret Hodge, said it was a very small amount for such a large project. "What is left in the budget for contingency is wafer thin, at only £36m. For a project of this size with unknown risks and eight months remaining, that is a tiny amount of money," she said. "Locog [The London Organising Committee of the Olympic and Paralympic Games] is likely to use all of its contingency funding and would also have to call on further government support if there are further cost increases." Mr Robertson said the increase in security costs was due to a change in the international security situation and not being able to complete final planning until the competition schedule and design of the venues was known. "When I started being minister there was no Arab Spring. No one really knows whether that's going to have a beneficial or adverse effect on our security." The NAO also raised its concern that the Olympic Delivery Authority's transport plan for the Games was behind schedule. It said the 109 miles of London roads being used for the Olympic Route Network - including 35 miles of special lanes primarily for the use of athletes and officials - had still not been integrated with local transport plans. Until the arrangements have been finalised, Locog and Transport for London will not be able to inform the public and businesses of the likely impact of the Games on the road network. The spending watchdog also said issues related to cutting journeys on buses and the London Underground by non-Games users by an average of 13% a day - rising to 30% on peak days - still had to be resolved. "The experience of spectators, visitors and Londoners in general would be diminished and the reputation of the Games put at risk if these issues were not sorted out," Mr Morse said. The NAO added the need to find so many additional guards represented a "significant recruitment challenge" and the Home Office was now in discussion with the Ministry of Defence about using military personnel. On Monday, the government said an estimated 23,700 security staff would be needed during the 2012 Games, which was more than double the initial estimate of 10,000 security personnel for venues. It said the venue security budget was likely to rise from £282m to £553m, while the budget for ceremonies has also doubled, with an extra £41m allocation. The Department for Culture, Media and Sport said the money for both increases would come from within the £9.3bn public funding budget for the Olympic and Paralympic Games after money was re-allocated from savings. The budget is additional to the private funding budget raised by the Games organisers Locog. Did anybody actually think it WOULDN'T exceed the budget? Where's your national pride everyone. This country is just full of whingers! Anywhere else and they would be proud of staging a sporting event as important as the Olympics. Put down the Daily Mail for a moment and celebrate something for once. I don't care how much it costs. We're getting the Olympics in our country and it's great. Pity we didn't get the World Cup too! What a bunch is miserable moaning codgers! The money has been spent on infrastructure that will last the next 25+ years, has lead to many transport project being fast tracked to be ready in time both of which will benefit the UK for years to come and helped keep british companies in work during difficult economic times. Stop being negative, I for one can't wait for the UK moment in the spotlight! Quelle surprise! These games were forced on the UK by the last government. They appeal to the minority of taxpayers despite the best efforts of the BBC to get us "excited" about them. It's strange how elitism in running and jumping is to be admired, but berated when it comes to intellectual pursuits. The people who want to watch sport (I think they are called spectators), should pay for it! Despite all the predictable moans and groans on here, I think the Olympic delivery has been a triumph. Most such 'budgets' are vastly overspent long before now, and we have the whole Olympic park ready nearly a year early. The investment is a huge boost for east London- if you don't believe that, just visit the totaly transformed Stratford. Hmmn. Nothing new there. However what I can't understand is why budgets for important things such as the health service have to be cut and we can't seem to afford to spend money on adequate care for our elderly and vulnerable people yet the country can afford to blow an extra several million on a few over-hyped weeks of running and jumping. Grrr! The Olympic Games are a commercial operation. They have ticket sales and sponsorship deals and TV rights to raise funds. Why are they getting any of our money? It's not as if we, as a nation, had any to spare: the government claims it cannot afford to meet its duty of care to us, so how can it justify supporting private sporting events?